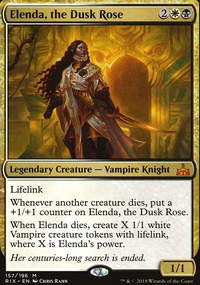 "In the end, death claims us all ..."
But Elenda, the Dusk Rose will live on. Elenda is an interesting commander for her second ability to work player has to do something he would never do normally in a commander match: put his commander in to the graveyard and not instead to the command zone. This deck is all about casting Elenda once from the command zone and after that only playing her from the graveyard. Main idea is to kill opponents creatures or your own for effects or counters on Elenda. Then you can either attack with her or sac her and attack with the many +1/+1 lifelink vampires. Win either with vampiric fury or with the dirty combos. Blood Artist / Zulaport Cutthroat / Kokusho, the Evening Star -> drain opponents to death. Hatred -> Attack with Elenda, the Dusk Rose and if she can hit, play this and you can knock out one player and gain all the life you paid back. 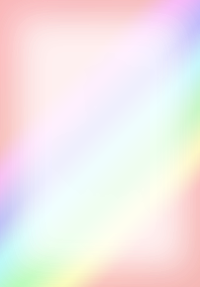 Fallen Ideal -> Enchant Elenda, the Dusk Rose with this and you can triple the amount of creatures you have. Reanimate / Animate Dead -> turn 2 Razaketh, the Foulblooded if you manage to discard it on turn 1. Sac outlet + Reveillark + Karmic Guide + Blood Artist / Zulaport Cutthroat -> Infinite drain. Ashnod's Altar + Nim Deathmantle + Blood Artist / Zulaport Cutthroat + Sun Titan -> Infinite drain. Ashnod's Altar + Nim Deathmantle + Blood Artist / Zulaport Cutthroat + Karmic Guide -> Infinite drain. Ashnod's Altar + Nim Deathmantle + Blood Artist / Zulaport Cutthroat + Elenda, the Dusk Rose -> Infinite drain. Ashnod's Altar + Animation Module + Blood Artist / Zulaport Cutthroat + Elenda, the Dusk Rose -> Infinite drain and counters on Elenda. Suggestions for better cards and comments on the deck are welcome!